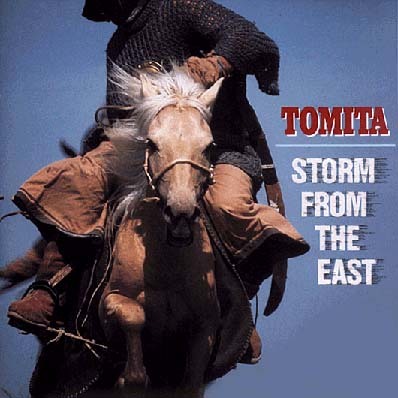 'Storm from the East', or 'Aoki Ohkami no Densetu' in Japanese, was released by BMG Victor in 1992 in Japan only. 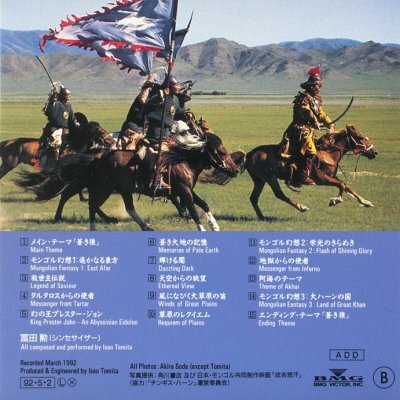 This soundtrack album contains music composed and performed by Tomita and the NHK Symphony Orchestra for an NHK/BBC co-production about the Mongol tribes of Asia. A different soundtrack by someone else was used for the final BBC version, and Tomita's version was not supposed to have been available in the UK. Extremely rich analogue/digital hybrid sounds, in danger of out-lushing Vangelis in the lush stakes. Also available as 'Legends of Blue Wolf'.